Are you familiar with roll, cavum and asperitas clouds? March 24, 2017, 3:09 p.m. The next time you look up in the sky and wonder what kind of cloud is hovering above, you can look down at your phone for the answer. Last revised in 1987, the World Meteorological Organization's (WMO) International Cloud Atlas has been the professional standard for identifying clouds since the late 19th century. Now the latest edition of the atlas is available online for free, and it includes 12 previously unlisted cloud formations, including roll and asperitas clouds. "Advances in science, technology and photography prompted WMO to undertake the ambitious and exhaustive task of revising and updating the Atlas with images contributed by meteorologists, cloud watchers and photographers," WMO Secretary-General Petteri Taalas said in a statement. But it wasn't just scientists who contributed. Citizen cloud watchers played an important part in getting at least one "new" cloud added to the mix. The asperitas cloud question has been hanging over the WMO almost 10 years. According to the BBC, the clouds were first recorded in 2006, looming in the Iowan sky. As more images began to pour in, the Cloud Appreciation Society president, Gavin Pretor-Pinney, and the Royal Meteorological Society began lobbying the WMO in 2009 for asperitas clouds to be recognized by the organization. "Back in 2008, I thought the chances of this becoming official were really minimal," Pretor-Pinney told the BBC. "At first the WMO were saying they had no plans to do a new edition, but over time I think they began to realize there is an interest among the public in clouds and there is a need for that interest to be an informed one, there's a need for this authoritative work." While asperitas clouds — whose name means "rough" in Latin — look quite scary, they rarely produce storms. Some clarification is necessary, however, because how we talk about clouds and how the WMO talks about clouds can be, well, a little cloudy in and of itself. The WMO has 10 basic genera of clouds, all defined based on where they form in the sky and their basic size. These genera are then divided into species that provide a more refined description of the cloud's shape and its internal structure. From species, the WMO drills down further for varieties to describe a cloud's transparency and arrangement. Some clouds have multiple varieties, and then there are supplementary features to clouds that appear with the clouds, or sometimes merge with them. An asperitas, for example, is a supplementary feature associated with stratocumulus and altocumulus clouds, so it's a newly recognized feature of two established genera of clouds. 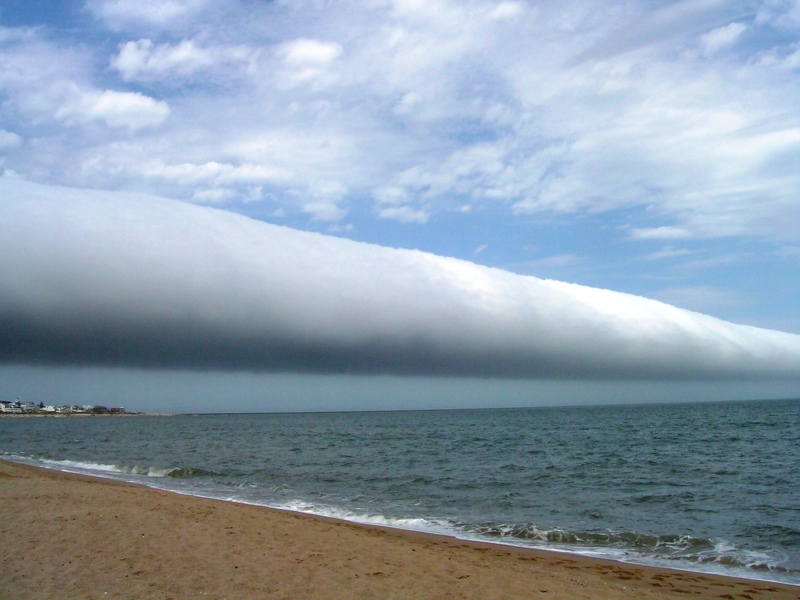 Only one new species of cloud was added to the atlas, and that was the volutus, or roll cloud. This long, tube-looking cloud seems to move slowly across the sky. Unlike an asperitas cloud, a roll cloud is often the herald of approaching storms. These wavy clouds are very short-lived supplementary features of cirrus, altocumulus, stratocumulus and stratus clouds. Commonly known as wall clouds, murus are a lowering of a cumulonimbus cloud. If you're familiar with supercell storms, you've probably seen one of these. Like, murus clouds, caudas are a supplementary feature of supercell cumulonimbus clouds. While murus clouds are the massive wall, the cauda is a cloud that forms at the bottom of the wall cloud. In the image above, you can see thee cauda cloud tail. A flumen is an accessory cloud to our now familiar supercell cumulonimbus clouds. If you look at the picture above for cauda clouds, you'll see a long tail of clouds right at the bottom. That's the flumen. One of the newly inducted "special clouds," cataractagenitus clouds form near waterfalls, the result of water broken up into spray by the falls. As their name might suggest, these special clouds may develop due to naturally occurring heat-related incidents, like forest fires or volcanoes. Homogenitus are special clouds that cover a range of man-made clouds. This includes clouds from industrial practices and contrails that are formed from airplanes. So the next time a child suggests there's a cloud factory nearby, you can tell her that she's not entirely wrong! These fleeting special clouds develop over forests, the result of evaporation along the canopy. Contrails get special-special-cloud treatment! Homomutatus clouds are multiple, persistent contrails that form over a period of time and seem to spread out over time. Roll clouds and contrails are among the11 clouds now recognized by the World Meteorological Organization in the International Cloud Atlas.